Happy Friday! Hope you all have a fun weekend ahead planned. We will be going to Bella’s first dance recital tomorrow (!!! ), then having our family back at our house to celebrate Frank’s 40th (this has turned into his birthday month!). A busy day planned for Father’s Day as well. Lots going on! 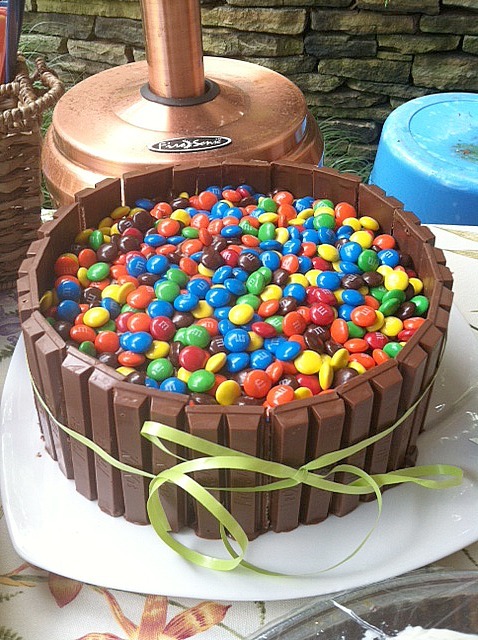 I saw this cake on Made in Mel’s Kitchen. It’s actually from last summer, and since I didn’t get a chance to blog it then, I figured now was a great time. It’s easy, a big crowd pleaser, and perfect to bring to a summer get-together. So impressive looking, too! I used this awesome chocolate cake recipe (feel free to use your favorite, or a box mix), let it cool, then stand a Kit Kat bar next to it to make sure the cake is a little shorter (trim it if need be), then frost (again, using your favorite recipe). This entry was posted in cake, candy, chocolate, dessert. Bookmark the permalink. I’ve seen this around the web, but never as well executed at this! Good job, Melissa! This has always been a cake I wish I had a reason to make! So fun & festive! How many packs ofcandy d u have to use.great cake.